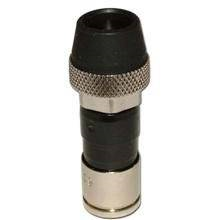 The professional Linear Compression tool is for RG-6 Digital Video Signal F Type Coaxial Cable Plug Connectors, Heavy Duty Steel. 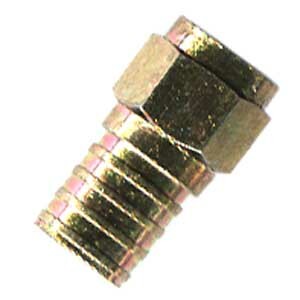 - - Provides a clear view of connector as it's compressed and locked into place. •Smooth One-Cycle Full Ratchet Mechanism. •Rugged Carbon Hardened Steel Construction. 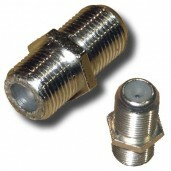 Compression tool is a great tool at a reasonable price for RG6/59 and BNC compression connectors. 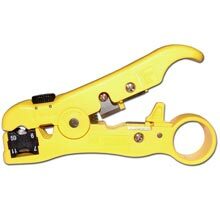 Pressure Snap crimp help prevent water encroaching into cable assembly. Excellent tool for professional installations. This unit comes right out of the box equipped to strip RG6 and RG59 Coaxial Cable. The blades can be adjusted to ensure a perfect cut every time. The stripper comes equipped with an allen wrench mounted to the bottom of it for adjusting the blades at any time. For most users, the units factory settings are perfect. 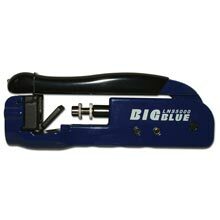 This universal tool strips RG6, RG59, RG7and RG11 Coax. Compscope RG6 coaxial cable w/ 18 AWG solid copper covered steel center conductor. Most available in boxes or reels in quantities of 1,000 feet. 10 Feet $6,50 Buy Now $7.530 Buy Now . 30 Feet $16.50 Buy Now $19.50 Buy Now . 40 Feet $21.50 Buy Now $25.50 Buy Now . 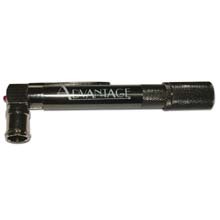 Advantage Cable Toner cable termination-testing device with one port for the cable lead and an audible sounder for tone verification. Designed for RF cable applications. 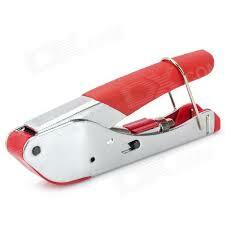 The handiest device professional installers use. Helps you troubleshoot cable problems by indicating open and short circuits. Tones out the circuit and has an LED visual indicator indicating good/bad connections. Compact and easy-to-store. For the Ultimate in performance and reliability there is only one choice. Snap-N-Seal Ultimate SNS1P6U compression connectors feature Thomas & Betts industry leading compression technology that has an unparalleled field track record of 15 years plus. Now one compression connector - the Ultimate Snap-N-Seal SNS1P6U for series 6 cable provides installers and subscribers with the ultimate overall performance. The one and only connector choice for RG6 series 60%, Tri and Quad shielded coax cables. 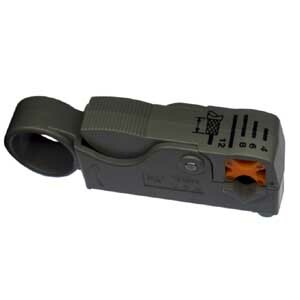 Thomas and Betts Ultimate Snap-N-Seal RG6 SNS1P6U compression connector. •One connector for 6 Series SCTE specification drop cables including 60% braid, tri-shield and quad shield. •To reduce assembly time and simplify installation, the plastic sleeve is pre-positioned and detachably coupled to the connector body. •The plastic sleeve's separability from the connector body further simplifies difficult installations. 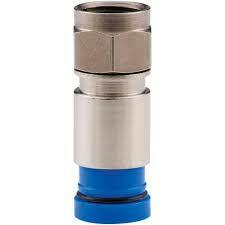 •True 360° compression onto cable ensures superior RF shielding performance. •Installation requires one-step 1/4" - 1/4" cable preparation. •Quad-sealed system prevents moisture migration. •Incorporates an iridescent chromate finish plus UV resistant plastic and O-rings to provide a reliable, environmentally sealed product. Install Kit Combo with Compression Tool, Stripper and Bag of 20 Thomas and Betts Ultimate compression snap-n-seal connectors. Install Kit Combo with 100 feet RG6 UL Cable ,Compression Tool, Stripper and Bag of 20 Thomas and Betts Ultimate compression snap-n-seal connectors. Install Kit Combo with 100 feet RG6 UL Cable ,Compression Tool, Stripper and Bag of 20 Thomas and Betts Ultimate compression snap-n-seal connectors. Also includes Grounding block, Copper 4 foot grounding rod and 25 feet belden 10 gauge copper grounding wire. Install Kit Combo with 300 feet RG6 UL Cable ,Compression Tool, Stripper and Bag of 20 Thomas and Betts Ultimate compression snap-n-seal connectors. Also includes Grounding block, Copper 4 foot grounding rod and 25 feet belden 10 gauge copper grounding wire. Grounding block, Copper 4 foot grounding rod and 50 feet belden 10 gauge copper grounding wire.